This Ricotta Cheesecake uses both ricotta and cream cheese to produce a light and creamy cheesecake. While it is much lighter in taste and texture than a New York Cheesecake, it also pairs beautifully with the graininess of a graham cracker crust. You can enjoy this dessert plain, but I prefer serving it with either fresh fruit or a raspberry, strawberry, blueberry, or cran-raspberry sauce. Of course, a Ricotta Cheesecake contains ricotta cheese. The name 'Ricotta' actually means "recooked". This cheese is highly perishable, made from the whey (watery residue from making other cheeses) that is cooked to produce a mild tasting, soft, yet granular white cheese. While you can use part skim ricotta, my preference is to use whole milk ricotta as it gives the cheesecake a much richer flavor. And try to use a brand of ricotta that does not contain a gum stabilizer. (The brand I use is Calabro which can be found in some grocery stores or in specialty food stores.) Depending on the brand, if the ricotta cheese is watery, I would drain it before adding it to the cheesecake batter. Do this by either placing the ricotta in a fine-meshed strainer or else a cheesecloth-lined strainer that has been suspended over a bowl. Cover and place in the refrigerator to drain for an hour or two, or even overnight. The most important thing to remember when making a cheesecake is to have all the ingredients at room temperature. You can make the cheesecake batter in a food processor, electric stand mixer, or with a hand mixer. If using a stand mixer beat on low speed to reduce the amount of air incorporated into the batter. Too much air will cause the cheesecake to rise during baking only to disappointedly sink once it has been removed from the oven. Another thing to remember is a cheesecake is really a type of custard, so it is best to bake it in a water bath. Use very hot or almost boiling water and pour enough water to come halfway up the sides of the spring form pan (wrap in aluminum foil to prevent seepage). As with all cheesecakes, let it cool before covering and placing in the refrigerator. While you can serve this cheesecake once it cools, I find it does benefit from sitting at least four hours or preferably overnight in the fridge so the flavors have time to soften and blend. You can freeze this cheesecake for about a month by wrapping it in foil and placing it in a airtight bag. Defrost by placing the frozen cheesecake in the refrigerator overnight to thaw. 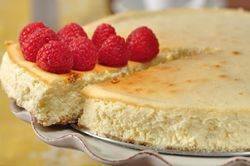 Ricotta Cheesecake: Preheat oven to 350 degrees F (180 degrees C) and butter, or spray with non stick cooking spray, a 9 inch (23 cm) spring form pan. Wrap the outside of the pan with two layers of heavy aluminum foil. Crust: In a bowl combine the graham cracker crumbs, sugar, and melted butter. Press the crumbs evenly over the bottom of the spring form pan. Refrigerate while you make the filling. Cheesecake Filling: In your food processor or electric stand mixer (or hand mixer), place the cream cheese and process (beat) until smooth with no lumps. Add the ricotta and sugar and process (beat) until smooth, scraping down the sides and bottom of the bowl as needed. Process (beat) in the cornstarch and salt. Add the eggs, one at a time, processing (beating) until incorporated. Finally, add the lemon zest and vanilla extract, and process (beat) until incorporated. Remove the crust from the refrigerator and pour in the filling. Place the spring form pan in a large roasting pan. Pour enough hot (almost boiling) water into the roasting pan to come about halfway up the sides of your spring form pan. Bake for about 50 - 60 minutes, or until the cheesecake is set, yet moves slightly when the pan is gently shaken (the edges of the cheesecake will have some browning). Remove the pan from the water bath and cool on a wire rack. Then cover and chill in the refrigerator for at least 4 hours, or preferably overnight. You can cover and store this cheesecake for 3-4 days in the refrigerator, or it can be frozen. *Note: If the ricotta is watery, put in a fine-meshed or a cheesecloth-lined strainer, placed over a bowl. Cover and place in the refrigerator to drain for an hour, or even overnight.